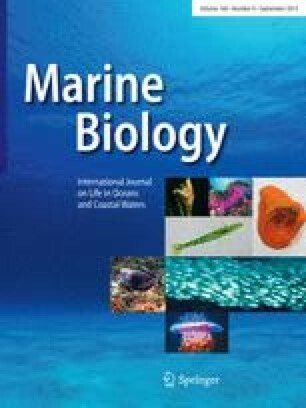 Movement and feeding were studied in a population of red sea urchins, Strongylocentrotus franciscanus (Agassiz, 1863), found within and immediately seaward of a kelp forest offshore from Santa Cruz, California, USA. Mean sea urchin movements varied from 7.5 cm/day inside the kelp forest to over 50 cm/day at 15 and 100 m outside the kelp forest. The percentage of sea urchins feeding decreased from 66% inside the kelp forest to 16 and 15% at 15 and 100 m outside the kelp forest. These data indicate that movement by these sea urchins is a response to a low food supply.